Thayer County Health Services is a comprehensive primary care system providing health and wellness services to the citizens of Thayer County and surrounding communities in Nebraska and Kansas. Thayer County Health Services is comprised of a Basic Level (Level IV) Trauma Center 17-bed Critical Access Hospital and a clinic in Hebron, and four satellite clinics in Bruning, Chester, Davenport, and Deshler. TCHS is a county facility that serves a 50 mile radius from Hebron and serves patients from over 288 communities. Besides its patient-centered inpatient facility, the hospital also supports a full spectrum of pre- and post-hospital services, along with programs designed to improve the community health and maintain community wellness. Learn more about our services. Thayer County Health Service’s tradition of caring began long before its first patient was admitted on Oct. 17th, 1948. It began in 1944 when members of the community gathered to discuss the possibility of using what was then the Hebron College and Academy for their hospital. Fred Knaut, general manger of the Lutheran Hospital and Homes Society of Fargo, North Dakota was asked whether his organization would be interested in operating the hospital from Thedora Hall, the girl’s dormitory of the vacant junior college. Knaut and several Lutheran pastors discussed the proposal but could not come to an agreeable solution, and the dream of a hospital in Thayer County was put on hold. Two years later, on April 26th, 1946, the dream became a reality. The American Lutheran Church received an offer from a private corporation to purchase the building for apartment use. Without time to spare, the Hebron Chamber of Commerce hospital Committee met. Within 30 minutes, they decided to purchase the building. Thedora dormitory was offered to the Chamber for $4,500 with the stipulation that the building be used for hospital purposes. Signing the final agreement were chamber members, M.L. Christensen, J.K. Musgrave, Paul Korff, G.R. Taylor, W.E. Baker and W.F. Powell. Financing the project fell on the shoulders of Thayer County residents. They met the challenge head-on and during the summer and fall of 1946 raised $35,000 to remodel and finance the project. Twenty-five incorporators representing the entire county were selected, a non-profit corporation was formed and officers were elected as follows: H.F. Nacke, Chairman, G.H. Wrightsman, Vice-Chair, F.O. Woodard, Secretary, and H.R. Killinger, Treasurer. The organization was completed on December 27, 1948. Lutheran Hospital and Homes Society (LHHS) provided the technical help with the hospital and later contracted to lease and operate the hospital. 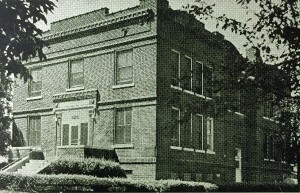 Remodeling of the building started in September, 1947. When more funds were needed to complete the project, an additional $30,000 was raised by residents of the county. An estimated 1,000 – 1,500 people attended the hospital’s dedication ceremony on Sunday, Sept. 18th, 1948. The laundry room was located in an old coal bin and an Army generator was used for backup power. The operating room and kitchen were located in the basement of the building, with the patient’s rooms located on the first and second floors. The nurses made everything – one of the jobs during “idle time” was to sharpen the stainless steel needles then in use on syringes. The first 20 years of the hospital proved very successful. By the early 1960’s the Hospital Board and Lutheran Hospital and Homes Society outlined the first plans for the present hospital building. In 1968, a thoroughly up-to-date, 22-bed facility was opened, marking a new era for healthcare and Thayer County Memorial Hospital. The Hebron Clinic was added in 1978. As time marched on and technology improved, it became apparent that further remodeling would have to be accomplished in order for the hospital to continue to meet the needs of its population. The first patient for Thayer County Memorial Hospital (as Thayer County Health Services was then known) was admitted on October 17. The first baby was born on October 26. This building served as the hospital for 20 years. Then by the early 1960’s the Hospital Board and Lutheran Hospital and Homes Society outlined the first plans for building what became the original part of the current hospital building. In 1968, a 22-bed hospital was opened, marking a new era for healthcare and Thayer County Memorial Hospital. The Hebron Clinic was added in 1978. As time marched on and technology improved, it became apparent that further remodeling would be needed for the hospital to continue to meet the needs of the local population. In early 1988, Thayer County ended its 38-year relationship with the LHHS. A Management Services Agreement was then entered into, with St. Elizabeth Community Health Center (now know as CHI – Catholic Health Initiatives) in Lincoln. That relationship continues to this day, and one in which the County and the TCHS Board of Directors is very pleased. In the mid-1990’s, the Hospital Foundation began an aggressive fundraising campaign for an expansion and remodel of the facilities. Completed in 1999, the project built a new clinic onto the hospital building, and modernized or expanded many of the facilities and spaces. In 1999, Thayer County Health Services became designated as a Nebraska Critical Access Hospital (CAH). Because rural hospitals are so unique, they require more flexibility from government regulations and federal policies. This helps them continue to provide access to cost-effective, quality healthcare services. When Congress made changes to the Medicare program in the mid- 1980s, it changed the way in which hospitals are paid for treating Medicare patients. The government’s actions unintentionally hurt small rural hospitals. Medicare no longer paid the actual cost of providing care to their patients in many rural hospitals. This resulted in hospitals losing money on certain procedures. The result was many hospitals faced bankruptcy and closure in the mid 1990’s, especially after the Balanced Budget Act (BBA) of 1997. The majority of CAHs are located in the section of the nation where a large segment of the population was 65 years or older. Nebraska leads the way in numbers of CAHs it had in operation. Before Congress established the Critical Access Hospital program through the BBA of 1997, the Nebraska Unicameral established a Critical Access Hospital (CAH) category. This new type of hospital is not much different from other hospitals. The primary difference is that the Medicare program uses a different method to pay CAHs for services than is used for larger hospitals. This method of payment helps smaller hospitals remain financially viable and maintains access to care for many rural communities. The CAH Status has allowed TCHS to remain a viable, high-quality hospital serving Thayer County and other communities in the region. In the Spring of 2004, the Foundation for Thayer County Health Services conducted a second Capital Campaign to help raise $1.5 million to allow for a 25,000 sq ft expansion project to the hospital. This project was completed in January of 2007 and included a new, modernized Radiology and Laboratory Department. Six new patient rooms and a lower level administrative space were also included in this project. Thayer County Health Services then remodeling the area of the hospital vacated by the X-ray and Laboratory Departments when they moved to their new locations. The new modernized Surgery Center was made possible by a generous gift from the Erwin A. Dunker estate. The Surgery Center was completed in 2008 with an Open House held on May 2, 2008. TCHS has converted to Electronic Medical Records (EMR) for all patients seen in its hospital and clinics. This project was made possible through a $1.6 million Health Information Technology (HIT) grant received by TCHS in the Fall of 2007. On August 2, 2015, TCHS broke ground on a $14.8 million hospital renovation and wellness project. Thanks to a generous gift of $6.9 million from the estate of Glenn Korff, Hebron alumni, the project includes adding a 17,000 sq ft addition for a new Rehabilitation and Wellness Center on the north side of the lower level of the hospital. The hospital building project was comprised of four phases. Phase I is the Korff Fitness and Wellness Center, the building project included three more phases. Phase II the renovation of the vacated Rehab Department into the new Kitchen and Cafeteria. Phase III the renovation of the old Kitchen/Cafeteria into a new Specialty Clinic. Phase IV included renovation of two of the current patient rooms into Labor and Delivery Suites, moving the Emergency Room (ER) closer to the hospital Nurses Station. To help fund the building project, the Foundation for Thayer County Health Services completed a Capital Campaign “Investing in Healthier Tomorrows” that raised $1,000,000 for Phase II of the Building Project. Phase II was the renovation of the kitchen and cafeteria. The latest renovation and wellness project was completed by the spring of 2018. An “Open House” for the public to tour the facilities and see all the changes was held on April 29, 2018. The latest changes to TCHS will allow them to meet today’s healthcare challenges and the future needs of Thayer County and the surrounding communities.